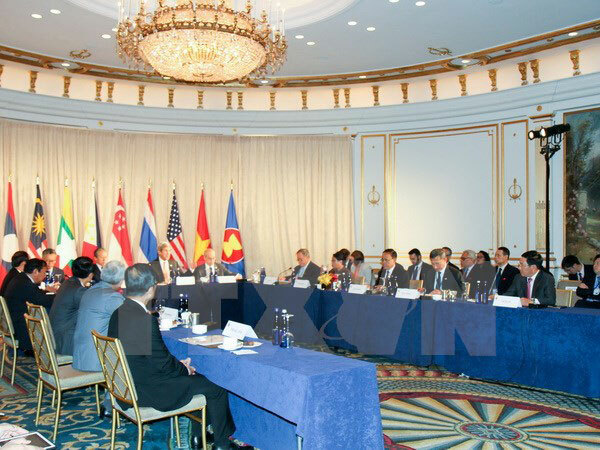 Peace, stability and prosperity in the region and the Southeast Asia in particular benefit both ASEAN and the US, stated Vietnamese Defense Minister General Ngo Xuan Lich during a recent informal meeting of US and ASEAN denfence chiefs in Hawaii. The responsible engagement of the US and other partners for peace, stability and development in the Southeast Asian region as well as in the Asia-Pacific will help ASEAN realise the ASEAN Community’s goals to 2025 and beyond. He expressed hope that the cooperation of the US will contribute to strengthening solidarity, unity and raising the central role of the Association of Southeast Asian Nations (ASEAN). The Vietnamese Defence Minister held that the relationship between the ASEAN and the US and other partners is significant to regional peace, stability and growth. He pointed to the need to increase dialogues, especially informal talks, to strengthen consultation and mutual understanding on policies and priorities of each party. ASEAN and the US should promote existing dialogue and partnership mechanisms such as the East Asia Summit (EAS), the ASEAN Defence Ministers’ Meeting Plus, and the Shangri-La Dialogue, he said. Minister Ngo Xuan Lich also stressed that all efforts for the maintenance of peace and the promotion of cooperation and development should be supported and facilitated. He asserted that Vietnam and the US should focus on building capacity in joint operation in non-traditional security matters by sharing information and personnel training support, suggesting that the US share more experience with ASEAN and assist the grouping in capacity improvement, especially in search and rescue in Southeast Asian region. Vietnam will send officials to ASEAN centres for maritime information sharing, military medicine, humanitarian aid coordinating and disaster relief, he pledged, adding that the setting up of the centres has contributed to reinforcing the solidarity and coordination among ASEAN countries as well as between the association and partners. He noted that during the visit of US President Barack Obama to Vietnam in May this year, the two countries signed an agreement to set up a working group for Cooperative Humanitarian and Medical Storage Initiative, which is a civil deal merely for humanitarian purposes. Meanwhile, US Defence Secretary Ash Carter affirmed that his country’s rebalance policy will be continued in the next President’s administration. He also reaffirmed the US ’ commitments to the Asia-Pacific. Lauding the contribution of the ASEAN to the ensuring of security in the Asia-Pacific, Carter stressed that the US support the central role of the ASEAN as well as cooperation mechanism led by the association in the region. At the meeting, the defence chiefs reaffirmed the commitments made by leaders of the US and ASEAN countries at the special US-ASEAN Summit in Sunnylands, the US in February 2016 and during the 4th US-ASEAN Summit in Laos in September this year. They discussed the formation of a regional security network through which countries can contribute to the maintenance of peace and prosperity in the region. The defence chiefs also exchanged ideas on maritime security, counter-terrorism and the settlement of non-traditional security challenges. According to Carter, all parties should exert joint efforts to cope with the non-traditional challenges such as natural disasters, piracy. He emphasised the importance of ASEAN coordination in humanitarian and disaster relief. He also voiced the US ’ wish to keep the Southeast Asia ’s vital waterways open and secure. On the sidelines of the ASEAN-US Defence Chiefs’ meeting, General Ngo Xuan Lich had bilateral meetings with his Malaysian, Thai and Singaporean counterparts. During the meetings, the ministers agreed to foster practical defence affiliation for the interest of each country, contributing to the maintenance of peace and stability in the region. The ministers also concurred that it is necessary to increase meetings among defence chiefs of the ASEAN for more effectiveness partnership as well as stronger solidarity of the ASEAN./.